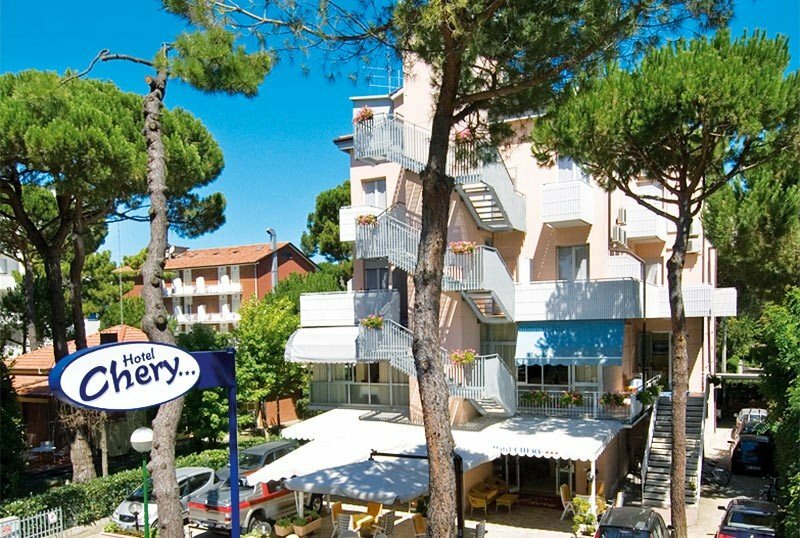 The Hotel Chery in Milano Marittima, a 3-star family-run hotel for over 30 years, is close to the pine grove and the sea. Among the services offered by the hotel: parking, WI-FI, free use of bicycles. Admits small animals on request. The hotel is located in Milano Marittima, halfway between the pine grove and the beach, in a quiet area. The beach can be reached on foot in less than 5 minutes. It takes about 10 minutes to get to the center. All rooms are air conditioned and equipped with LCD satellite TV, safe, minibar, direct dial telephone, WI-FI and private bathroom with shower and hairdryer. Most have a balcony. The hotel has an equipped garden, free bicycles, TV lounge, bar, elevator. It offers guests a welcome drink on Sundays and organizes theme nights. CONVENTIONS: beach, amusement parks, discos, gym, spas, organized excursions on request. SERVICES FOR DISABLED: entrance and rooms on the ground floor, room with wheelchair maneuvering space, wheelchair access shower. PETS: small pets allowed, on request. LUNCH AND DINNER: local cuisine with 3 choices menu and fish dishes every day, vegetables and appetizers buffet. VARIATIONS: on request vegan dishes and for celiacs. At the restaurant: baby menu on request, baby food, high chairs. On the beach: baby club, mini club, entertainment, children's pool. 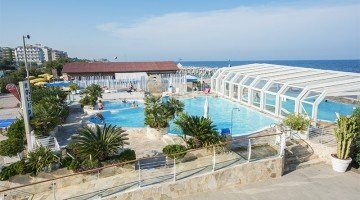 The hotel has an agreement with the Bagno Holiday Village bathing establishment n. 305bis / 306, n. 299, n. 300. At guests' disposal two heated swimming pools surrounded by solarium and wellness area (water gym, hydrobike, live entertainment for adults and children); the pools have a hydromassage, a waterfall and a dedicated area for children. The prices of the price list are per person per day for a min. 3 days in full board and min. 5 days in All Inclusive. Open the summer with us! Super offer first weeks of June in Milano Marittima! In All Inclusive Formula, starting from € 55.00 per person per day. 2 children up to 10 years - 50% discount each, in room with 2 adults. JUNE SPECIAL: OPEN SUMMER WITH US!